After a quick (and totally acceptable) overnight at the Sheraton Gateway LAX, we woke up around 6AM for our 9:40 AM departure. We showered, packed, and headed downstairs to find the hotel shuttle bus waiting for us. 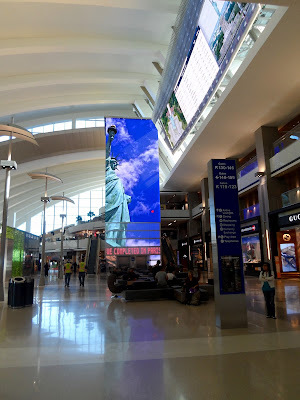 We arrived at the Tom Bradley International Terminal (TBIT) around 6:45 which was perfect timing since Cathay's check in desk opens 3 hours prior to departure. Check in was efficient and the agent was extremely friendly. She was able to move our seats so that we had a window and an aisle (vs. two aisles). The airport was absolutely dead and even without pre-check we were both airside within 5 minutes. 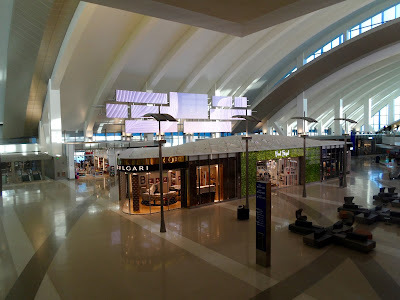 This was my first time departing from TBIT and I was blown away. The airport is gorgeous. Great to see in the US.